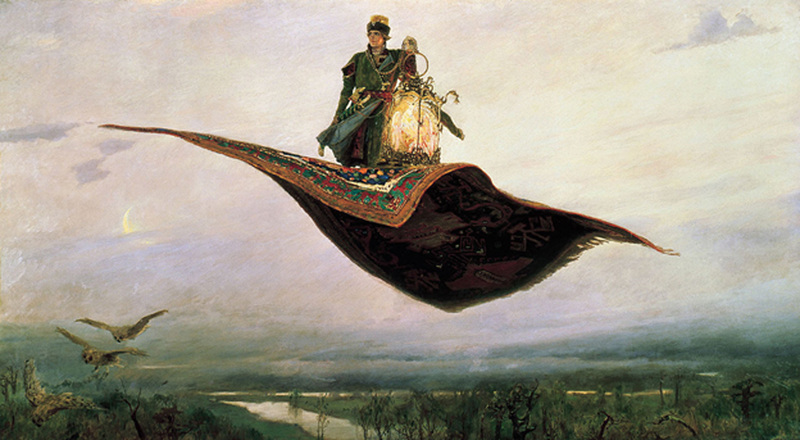 Magic carpets are a form of transportation most notably found in oriental tales. These carpets are known also as flying carpets, as they transport their owners from one place to another through the air. Whilst magic carpets are perhaps most commonly associated with the stories found in the Thousand and One Nights , magic carpets have also been mentioned in the writings of different civilizations at various points of time in history. Interestingly, contrary to popular opinion, the magic carpet does not feature prominently in the Thousand and One Nights . For example, in the Galland manuscript, the oldest manuscript which contains the first 282 (out of 1001) stories, no mention is made of magic carpets. In the original version of ‘Aladdin and the Magic Lamp’, the abduction of Princess Badroulbadour and her bridegroom on their wedding night happened not on a magic carpet, but on their marriage bed, which was carried through the air by the genie of the lamp. It has also been asserted that magic carpets make their first appearance in more modern versions of the tale, most visibly Walt Disney’s 1992 Aladdin. Still, the history of magic carpets may be traced back to an earlier point in time. It seems that King Solomon of Israel is the earliest known historical figure to be associated with magic carpets. There are at least two versions of the tale of King Solomon and his magic carpet. One of these is said to have been written by a 13 th century AD. Jewish scholar by the name of Isaac Ben Sherira. This story is claimed to have been compiled from two ancient works that have since been lost. In Ben Sherira’s story, the legendary Queen of Sheba had a royal alchemist who managed to make a small brown rug hover above the ground. Years later, the alchemist perfected his skill, when he discovered that the trick lay in the carpet’s dying, rather than in its spinning process. When the queen heard this good news, she had a magic carpet made, and sent to King Solomon as a token of her love. This carpet is said to have been made of green silk which was embroidered with gold and silver, and studded with precious stones. The carpet is also said to have been so large that the king’s host could stand on it. When the carpet arrived, Solomon was busy with the construction of the Temple of Jerusalem. He could not receive the gift, and gave it to one of his courtiers instead. When news of this cold reception reached the Queen of Sheba, she was heart-broken, and decided not to have anything more to do with magic carpets. Without royal patronage, the alchemist (and his artisans) could no longer make magic carpets, and the knowledge is said to have been lost forever. Alternatively, it has been claimed that the artisans involved in the making of the magic carpet wandered around for years, before settling down somewhere in Mesopotamia. In another version of the Solomon story, the king received his magic carpet from God himself. This carpet is said to have been able to carry 40000 men in the air at any given time. Being in possession of this carpet, Solomon’s pride is said to have grown each day. Eventually, God decided to punish Solomon, and whilst the carpet was flying in mid-air, He shook it, thus causing the 40000 men on it to fall to their deaths. Apart from being a mode of transportation, magic carpets have also been depicted as a sort weapon that was used during wars. One of these stories relates to a late 2 nd century B.C. Parthian king by the name of Phraates II. In 130 B.C., the king is said to have been engaged in a war with Antiochus VII, the ruler of the Seleucid Empire. In the story, Phraates flew from the heights of the Zagros Mountains on a carpet or a piece of cloth to confront his enemy, which he destroyed with fire and lightning. Phraates was given a triumphant reception when he returned, and is said to have floated over the heads of his subjects on his magic carpet. In another story, the 3 rd century AD. Sassanian ruler, Shapur, is said to have had a magic carpet too. Using his carpet, Shapur sneaked into the camp of the Roman army one night, surprised the Emperor Valerian, who was asleep, and abducted him. In my quest as an theist to discover IF there is in fact God, years ago I had an interesting experience. I was in my rented rooms in Varanasi, India where I had been reading hindu and Buddhists scriptures guided by a saint. I slept on the traditional bed. These things were uncomfortable and always too short, consisting of a wooden frame witrh a rope woven lattice to support you. I always slept badly and later moved to the rug on the floor! Anyway, though fascinated by the mythologies as stories, I had still no evidence at all. But then one night I was asleep, and when some THING woke me up I was in mid-air several feet clear of the floor, cool! Lying there, I thought to myself, nah, I'm only dreaming, at which point the bed slammed back down on the floor. Shocked, I sat up, unable to believe the evidence of my senses, but quite upset by what had happened. So I decided to get back to sleep. Well, as I was nodding off, I said to whatever it was, and to myself that I'd believe it if it happened again. And as soon as I had that thought the bed and I rose up into the air again. God is just so cool!! There is historical basis for a 'flying carpet'. There was/is a tribe in South America that created and sailed small paper hot air ballons. There were depictions of black triangular, upside down pyramid type designs which some archaeologists thought might be hot air ballons, with the black coloring coming from not just dye but on the inside ash from a soot fire that seal the weave. The result was that the ballon, when inflated with hot air at the right time of day would become airborn and continue to be heated by the sun for a longer flight. Models were made which worked. That the people of South America once sailed these balloons would also be a possible explanation for Eric Von Danagin's fire blackened holes, as well as the ability to observe the lines on the ground at places notably in Paru. I have woundered why not also might the European and African continents have had at one time hot air balloons and even perhaps Derragables, that would explain where the idea of flying ships might come from? Interesting enogh, silk is one of the few materials that would be suited for the necessary type of cloth, a tight weave and strong and light in weight. (need edit button). Note...the Black Trianglar balloons were made of cloth, not paper. And please pardon the misspells. There is a book out that detailed the exploration into the South American balloon construction , but unfortunately I cannot remember what it was called. Wow, I actually never thought that magical flying carpets can have any historical background other than appearances in "Thousand and One Nights" and "Aladdin". That's definitely a good story for https://www.aussiessay.com.